Pirate pyrotechnics can deliver explosive results in Bombs, a 5 reel, 7 row, 20 payline video slot from Playtech. 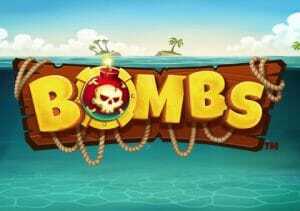 Look out for special Bonus Bombs which when detonated can deliver multipliers, cash prizes, added wilds and free spins. Play on your PC, tablet or mobile from between 20p and £200 per spin. The set up in this pirate adventure is a little unorthodox as the reels are on the ocean floor. There you’ll find heart, diamond, club and spade symbols as well as a treasure map, a skull and an anchor. The red-bearded pirate skipper is the most rewarding of the standard symbols, paying 1.5, 5 or 10 times your bet if you land 3, 4 or 5 in combination. The best overall payer is the treasure chest wild. This can land on all 5 reels and substitute for all symbols. Land 3, 4 or 5 of these in combination and you’ll pocket an award of 2, 10 or 20 times your total bet. Cash prizes – you’ll win the amount shown on the Bonus Bomb which can be anything up to 10 times your bet. Added wilds – an explosion adds between 5 and 10 extra wilds into play. Multiplier – any winning combination plus cash Bonus Bombs are boosted by a 2x to 10x multiplier. Trigger All – this detonates all of the Bonus Bombs on screen and activates all of their modifiers. Free Games – activate this bomb and you’ll receive 10 free spins in the Bombastic Free Games feature. The Bonus Bombs land more regularly in the free spins round than in standard play. You can also win more free spins with up to 70 in total available. Mystery Bomb – this can turn into any 1 of the Bonus Bombs above. You can bring a second ship into play if you wish, with the Extra Ship feature – this increases the potential number of Bonus Bombs that can hit. This will set you back an extra 1.5 times your bet per spin. For example, at 20p stakes it would cost 50p per spin to add the second ship. We liked this simple seafaring adventure. The visuals are good and soundtrack has a jaunty feel. You can expect to land the Bonus Bombs regularly, especially if you pay extra to bring the second ship into play. It’s all about the multiplier bonus bomb as a 10x multiplier can reward you payouts of 4,000 times your bet on every spin/free spin. Bombs takes a classic theme and shakes it up rather well. If the detonators work their magic, then Bombs can deliver some explosive action. If you like pirate themed video slots, ELK Studios’ Wild Seas or NextGen Gaming’s Wild Plunder should be braved.